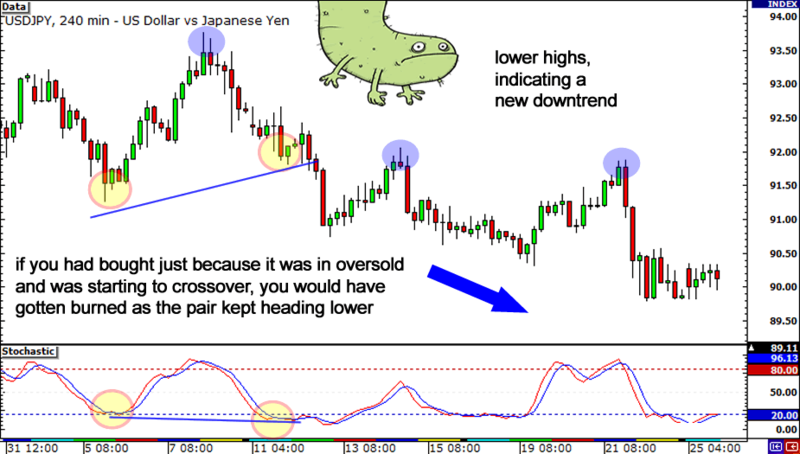 While using divergences is a great tool to have in your trading toolbox, there are times when you might enter too early because you didn’t wait for more confirmation. If you keep entering too early, you’ll keep getting stopped out (you do use stops right?!) and you’ll slowly rack up losses. And you know what happens when even small losses accumulate, you’ll end up broke. 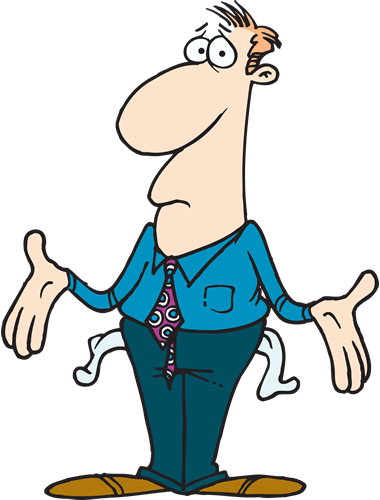 You’ll end up with a divergence between your mind and your wallet regarding your wealth. Below are a couple of tricks that you can make use of so that you have more confirmation that the divergence will work out in your favor. Wait for an indicator crossover. This ain’t so much a trick as it is a rule. Just wait for a crossover of the momentum indicator. This would indicate a potential shift in momentum from buying to selling or vice versa. The main reasoning behind this is that you are waiting for top or bottom and these can’t be formed unless a crossover is made! In the chart above, the pair showed lower highs while the stochastic already made higher highs. Now that’s a bearish divergence there and it sure is tempting to short right away. But, you know what they say, patience is a virtue. It’d be better to wait for the stochastic to make a downward crossover as confirmation that the pair is indeed headed down. A couple of candles later, the stochastic did make that crossover. Playing that bearish divergence would’ve been pip-tastic! What’s the main point here? Just be patient! Don’t try to jump the gun because you don’t quite know when momentum will shift! If you aren’t patient, you might just get burned as one side keeps dominating! Wait for indicator to move out of overbought/oversold territory. Another trick would be to wait for momentum highs and lows to hit overbought and oversold conditions, and wait for the indicator to move out of these conditions. The reason for doing this is similar to that of waiting for a crossover – you really don’t have any idea when momentum will begin to shift. Let’s say you’re looking at a chart and you notice that the stochastic has formed a new low while price hasn’t. You may think that it’s time to buy because the indicator is showing oversold conditions and divergence has formed. However, selling pressure may remain strong and price continues to fall and make a new low. You would have been pretty bummed out as trend didn’t continue. In fact, a new downtrend is probably in place as the pair is now forming lower highs. And if you were stubborn, you might have missed out on this down move too. If you had waited patiently for more confirmation that the divergence had formed, then you could have avoided losing and realized that a new trend was developing. 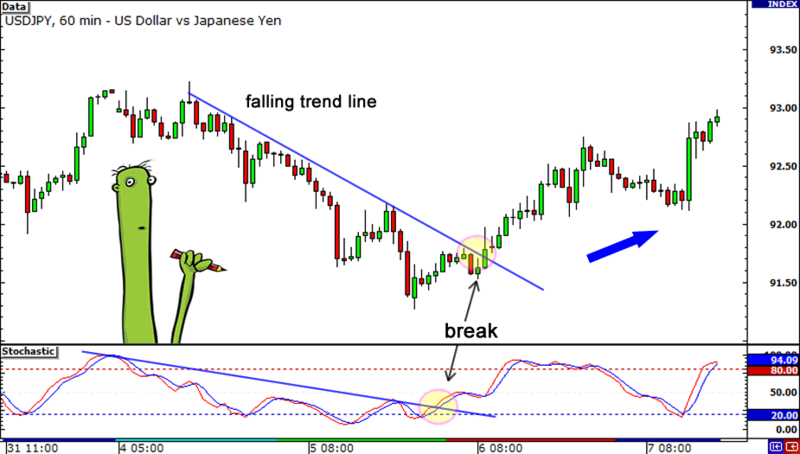 Draw trend lines on the momentum indicators themselves. This might sound a little ridiculous since you would normally draw trend lines only on price action. But this is a nifty lil’ trick that we wanna share with you. After all, it doesn’t hurt to have another weapon in the holster right? You never know when you might use it! This trick can be particularly useful especially when looking for reversals or breaks from a trend. When you see that price is respecting a trend line, try drawing a similar trend line on your indicator. You may notice that the indicator will also respect the trend line. If you see both price action and the momentum indicator break their respective trend lines, it could signal a shift in power from buyers to sellers (or vice versa) and that the trend could be changing. Oh yeah! Break it down like a Michael Jackson video!